Dalmatian - Sirius Cavell | Canine Training<p>by Mystic Moon, Inc.
Look at all these Titles! Dalmatian were bred to run with horse drawn carriages, which requires high energy and stamina. Few people know, they were also there to protect the owners and horses from wolves and highway robbers, which means a fearless, protective temperament. So, let's review - high energy, stamina, fearless, protective, and head strong. 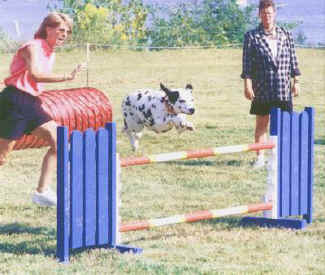 Cavell was my very first Agility dog. Thank goodness he was very forgiving as I learned, and made dozens of mistakes.